Owned by a mother-daughter team, Spicer Bags creates eco-friendly bags that combine quality workmanship and contemporary design. The Sidekick is a versatile and durable cross-body bag. Did not like the size or format. Spicer Bags are modern, eco-friendly, and 100% American made. 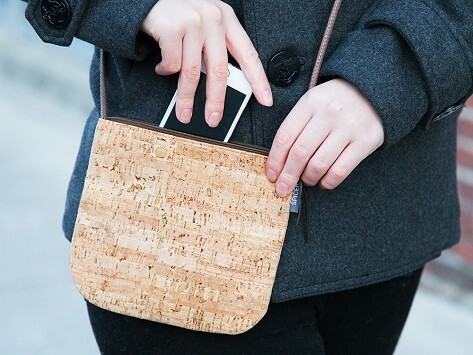 Operating out of a manufacturing studio in San Francisco, Spicer utilizes top-quality materials and contemporary designs to create textile and cork bags that are as fashionable as they are functional. Bonnie and Sarah Gemmell are the mother-daughter team behind Spicer Bags. When their friend Sally Spicer Rankine was diagnosed with cancer, Bonnie and Sarah bought the company rather than allow it to close. Today, they continue to build the company—and Sally’s legacy—in a way that would make her proud. Their earthy, eye-catching Cork Collection is made from cork that is harvested sustainably in Portugal—home to 50% of the world’s Cork Oak trees—yet Spicer uses other American components whenever possible (canvas woven in New Jersey, for example). When you carry a Spicer bag, you’re not only making a fashion statement, you’re stating your support for environmentally minded, American manufacturing.